Adrian Healey - ESPN Press Room U.S.
Adrian Healey joined ESPN in 2003 as a soccer play-by-play commentator for ESPN International’s coverage of several European leagues including Spain’s La Liga, Italian Serie A and the UEFA Champions League. He is also host of ESPN Soccernet Press Pass, the popular soccer opinion and debate program aired on ESPN International’s English-language networks around the world. Healey served as a play-by-play commentator for ESPN’s award-winning presentation of the 2010 FIFA World Cup South Africa, his second FIFA World Cup for the network, having been in a similar role in the 2006 FIFA World Cup Germany. 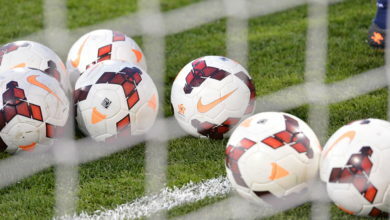 He also provided play-by-play commentary for the company’s critically-acclaimed coverage of FIFA Women’s World Cup Germany 2011, his second Women’s World Cup, having worked the 2007 tournament held in China. 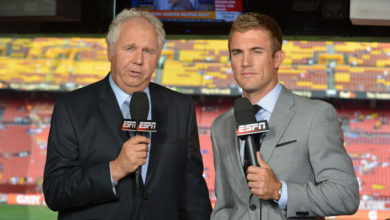 Beginning in the 2011 Major League Soccer season, Healey was named the primary English-language television voice for MLS on ESPN networks. Healey served as a play-by-play announcer for ESPN’s English-language coverage of the UEFA European Football Championship 2012 (UEFA EURO 2012), having performed similar duties for UEFA EURO 2008, including calling the Spain-Germany final on ABC. He also served as television play-by-play announcer for NBC Sports at the 2008 Summer Olympics. Prior to joining ESPN, Healey started his broadcasting career at the age of thirteen calling games from Swindon Town FC, his local pro team, on an amateur hospital radio station. Healey’s first professional soccer broadcasting was radio work with Caters News Agency in Brimingham, UK in 1988. From 1998-2003, he became the local television and radio play-by-play voice of the New England Revolution in MLS for six seasons, as well as an alternative rock radio on air personality at Boston radio stations WFNX and WBCN in the mid-nineties.